Canadian Minister of Foreign Affairs Chrystia Freeland speaks during negotiations for a new North American Free Trade Agreement in October. "We know that a win-win-win agreement is within reach and that is what we are working toward," she said Friday. Lighthizer said the talks with Canada were "constructive, and we made progress. Our officials are continuing to work toward agreement." U.S. trade officials will meet with their Canadian counterparts next Wednesday, he said. Trump said he intends to enter into an agreement "in a timely manner, to meet the high standards for free, fair, and reciprocal trade," in a formal letter to Congress. Trump said the proposed deal would help American farmers through improved market access, create "a more level playing field" for American workers, and include tough labor and environmental rules. 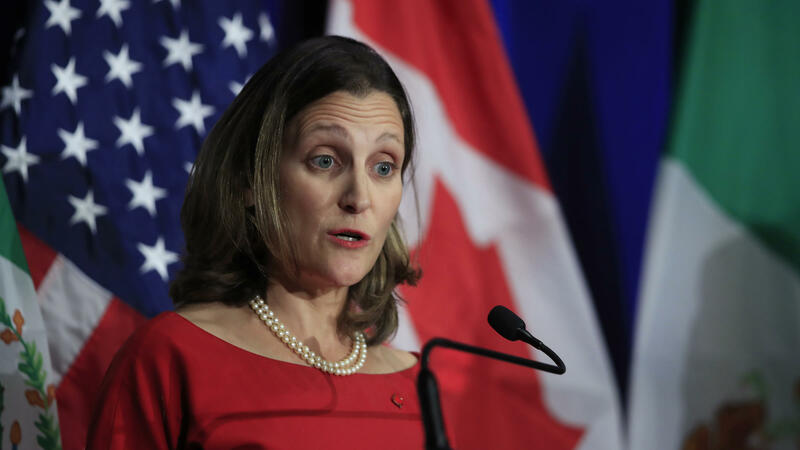 In a news conference, Canadian Minister of Foreign Affairs Chrystia Freeland confirmed that the talks toward an agreement with all three countries would continue. "We know that a win-win-win agreement is within reach and that is what we are working toward," she said. "We've made good progress, but there's still work to be done." Gordon Ritchie, Canada's former ambassador for trade negotiations, told NPR, "The main sticking point right now is Mr. Trump's determination to be able to impose his will on Canada, and brag about it to his electorate. I caught the other night, I guess it was last night, a speech he gave, and frankly like most Canadians, I was just shocked at the vitriol." "He talked about how those mean Canadians have these enormous trade barriers against imports from the United States, which are depriving Americans of markets in this country," Ritchie said. "Of course, nothing could be further from the truth. We are by far the biggest and best market for American goods and services." Canada rejoined NAFTA talks on Tuesday, a day after the U.S. and Mexico reached a deal tweaking the free trade agreement. Trump said he had a new name for that pact: the United States-Mexico Trade Agreement. The White House had said a deal with Canada had to be reached by Friday, when it would send the Mexico agreement to Congress for a 90-day review required by law. Ritchie told NPR that Canada's negotiations with President Trump were different from those with past U.S. administrations. "The difference is we have here, a president who in his public utterances is completely disconnected from the truth. And that makes it hard for his negotiators to deal with, because he's saying to them, I don't care how you do it, bring back a head on a platter," Ritchie said. "The obstacle to agreement is not on the Canadian side. The Canadians are perfectly interested in having an agreement, to modernize the existing arrangements," Ritchie said. He told NPR that President Trump's aggressive stance undercuts U.S. negotiators, "The Canadians are prepared to show flexibility on the crucial issues. Quite a lot of flexibility. That's not the problem. The problem is, that the American negotiators do not have authority to accept that agreement." The new agreement would take over for NAFTA, the landmark pact reached in 1994. That deal was struck among three countries — Canada, the U.S. and Mexico — and removed many barriers to trade and investment among them. Originally proposed by President Ronald Reagan, NAFTA was approved by Congress after lengthy negotiations and signed into law by President Bill Clinton. NPR's Jim Zarroli contributed to this story.